Are you dreaming of a green Christmas? Click here to play! You'll certainly find it in this holiday themed game. Celebrate Christmas early this year by spinning in plenty of big wins! Christmas is just not the same without Santa. See if you can spot this mythical man on the reels as he will bring you a few presents. Santa is a wild symbol and will replace most other symbols to help you create more wins. Plus, if he appears in a winning line, he'll double your prize. If you can spin two to five of him across a pay line, you'll get up to 5000 times your line bet. Ring in a few wins with the silver bells. Two to five of this symbol will bring in up to 1000 times your line bet. There are plenty of other holiday symbols to help you celebrate the Yule tide season, including candles, turkeys, hot coco (with marshmallows mind you! ), tree baubles, holly, presents, stockings, candy canes and Christmas trees. Be sure to take a sleigh ride through the fluffy, white snow, as this symbol will award you with a number of free spins in which prizes are tripled! That's sure to bring in quite a few monetary presents. 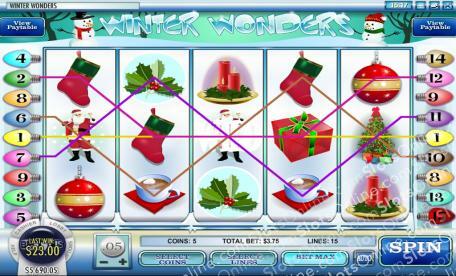 Enjoy your holiday season early in this super fun seasonal slots game! The sleigh acts as a scatter. If you spin three or more anywhere on the board and you will bring in 3, 4 or 5 spins respectively. Free spin prizes are tripled. If you can spin two to five sleighs on an active pay line, you'll get 100 times your line bet. Jolly ol' St Nick acts as a wild. Spin two to five of him on an active pay line and you'll get up to 5000 times your line bet. He will replace most other symbols (excluding scatters) to create more winning lines. If he appears in a winning combination your prize will be doubled.